Few things are as annoying as false alarms. In the workplace, they could force all of your workers to exit the property – regardless of the weather – until there is verification as to whether there is an emergency or not. 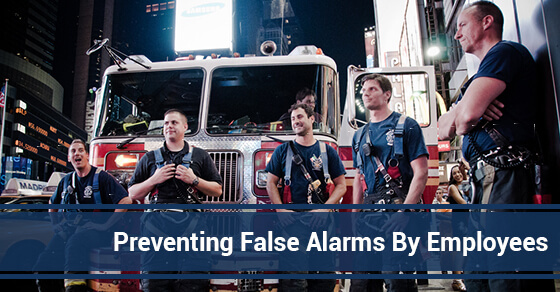 In addition to the possible inconvenience that false alarms can cost, there may also be financial costs since third-party responders might send you a bill if they come to your property… only to find that it was a false alarm. It’s said that more than 90 per cent of false alarms stem from user error, which means that you can definitely reduce the odds of false alarms if you can get through to your workers. So that you can reduce false alarms, what follows are four ways your employees can prevent false alarms. If you’re going to go through the process of installing a comprehensive security alarm system, you owe it to yourself and your employees to have training on how the system works and how to use it properly. Ask your installer or monitoring company how to properly use your security alarm system. You need to ensure that your employees don’t attempt to beat the system. What this means is that if they need to go back into the building after activating the alarm, the best course of action is to immediately disarm the system rather than to try to go back and get what they want as the system counts down before arming. If an alarm is accidentally activated, ensure that your workers know how to report a false alarm. Doing so can save you money since a police officer or security guard won’t have to be dispatched to your property if they know that it was a false alarm. Lots of things can trigger a false alarm, so it’s best to notify your security company in the event that you plan to, for instance, do any renovations, changes to your office layout, or installations of ceiling fans or skylights. Any of these things could impact your security alarm system, so consult with your provider to know if any precautions need to be taken. All your employees need to be on the same page if you’re going to succeed at eliminating false alarms, which can range from being a nuisance to being costly. If you can get them on board, you’ll be able to reduce instances of false alarms, if not make them a thing of the past.